Hastings United Football Club produced the perfect response to its narrow defeat in Sunday’s top-of-the-table clash by recording its biggest league win of the season tonight (Tuesday). Five different players were on the scoresheet as Hastings produced an impressive display to win 5-0 at home to Herne Bay in the Bostik League South East Division. 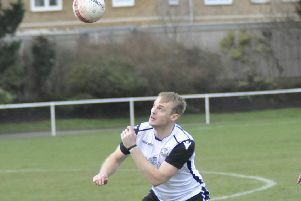 The convincing victory strengthened Hastings’ hold on second place in the table and maintained their 100 percent home league record. Hastings manager Chris Agutter made two changes to the side which lost 2-1 at Cray Wanderers two days previously. Jamie Fielding came in for Emmanuel Mensah, who injured his groin in the warm-up, and Sam Cruttwell replaced an unwell Tom Climpson. On a lovely looking Pilot Field pitch, Hastings started very strongly and took the game by the scruff of the neck with two goals in the first 12 minutes. They took just two-and-a-half minutes to open the scoring. Sam Adams found Youssouf Bamba in the left-hand side of the area and he worked the space he needed to drill a low shot past Bay goalkeeper Simon Overland. After a powerful Adams drive from the edge of the box deflected just over, Hastings went two-up with a goal that owed everything to Daniel Ajakaiye’s sharpness and ability to create something out of nothing. The jet-heeled forward dispossessed Bay defender Connor Wilkins a few yards outside the visitors’ box and coolly slotted past Overland for his 21st goal of the season. Lanre Azeez cleverly nipped the ball past Raphe Brown before seeing his angled shot blocked by Wilkins, while at the other end, Thomas Barton sliced wastefully wide from an inviting position inside the area. Alex Mulrooney-Skinner, who destroyed Hastings as Bay won 4-2 in the corresponding fixture last October, had the ball in the home net midway through the first half only to be flagged offside. Hastings carved out four pretty decent chances to add to their tally during the closing 15 or so minutes of the opening period, but were unable to convert any of them. Bamba hit the side-netting after Jack Dixon won possession and played him in, while Ajakaiye was denied by a smothering save from Overton having beaten the last defender. Adams shot just over from the edge of the box following more good work from Azeez and Dixon. Overland then produced a fine save from Ajakaiye after a superb run and pass by Bamba. Hastings remained firmly in the ascendancy during the second half and after Overland pulled off another smothering save at the feet of Azeez, the home side put the result firmly beyond doubt with two goals in five minutes around the hour mark. It was 3-0 in the 57th minute when Bamba’s free kick from the left bounced around in the area before Adams drove a low left-footed shot into the net from eight yards on his 499th appearance for the club. Dixon’s sweetly-struck shot from outside the box was well held by Overland, but the goalkeeper was powerless to prevent Dixon making it 4-0 on the hour. Azeez pulled the ball back to the midfielder, who neatly stepped past an opponent before driving home left-footed. Jake Embery struck the face of Hastings’ crossbar with a terrific effort from the edge of the box before Hastings wrapped up the scoring in the 72nd minute. Hassan Ibrahim played a magnificent defence-splitting pass to put Azeez clean through and he rolled home his first Hastings goal. Antonio Walker then hit the post with a deflected shot from just inside the area and Bamba couldn’t beat Overland after cutting in from the left. Bay had a sniff of an added time consolation, but Kyron Lightfoot’s shot was well blocked by Cruttwell. Hastings: Horlock; Fielding, Howlett-Mundle, Cruttwell, Beale; Ibrahim, Dixon, Adams (Makwiramiti 76); Azeez, Ajakaiye (Walker 70), Bamba. Subs not used: Lovatt, Taylor, Mensah. Attendance: 360. * A minute’s silence was held before kick-off in memory of league president Alan Turvey. Bostik League South East Division top half (played-points): 1 Cray Wanderers 12-34 (+21 goal difference), 2 HASTINGS UNITED 11-27 (+19), 3 VCD Athletic 12-24 (+8), 4 Phoenix Sports 13-24 (+6), 5 Hythe Town 12-23 (+7), 6 Whyteleafe 10-18 (+7), 7 Haywards Heath Town 12-18 (+3), 8 Whitstable Town 12-18 (-2), 9 Ashford United 12-17 (+4), 10 Ramsgate 12-16 (+2).